Click the Search button and then select a data source. See “Kinds of Data Sources,” earlier in this book. Use the Link to drop-down list to select another widget on the same dashboard. Most InterSystems IRIS Business Intelligence data sources can have multiple rows and columns. When you display any of these in a meter widget, the widget uses only the first row of data. Any additional rows are ignored. Optionally specify the basic settings, as described in “Adding a Widget to a Dashboard,” earlier in this book. Also see “Basic Meter Options,” in this chapter. Add at least one property, as described in “Adding Properties,” earlier in this book. 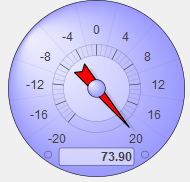 By default, the type of each meter is the same as the type of the parent meter widget, but you can modify the type for individual meters. For additional details, see the following subsection. For examples and a comparison, see the next section. A meter widget has multiple properties, each of which is displayed as a separate meter within the widget. Consider the preceding example, which shows a widget with three properties, each shown in a separate speedometer. For the first row of data, each column of the data source can be displayed as a property of the meter widget, that is, as a separate meter within the widget. In the examples shown here, all the meters in a meter widget are of the same type, but you can configure the widget to use different types within a single widget. Analyzer  Select this option to include the Mini Analyzer button on the toolbar. This button enables the users to open the data source in the Mini Analyzer. This option is supported only when the data source is a pivot table. 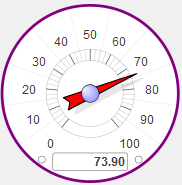 This menu includes additional options that control the look of the meter; the options depend on the kind of meter. The rest of the chapter provides the details. These options add a button to the toolbar. If you use these options, be sure the toolbar is visible (its display is controlled via the Toolbar option in Settings). See “Reconfiguring a Widget,” earlier in this book. The actual value is always shown in the box. You can add thresholds within the scale, shown as different color bands in the scale. You can add a target value shown as a line on the scale. You can add thresholds within the scale, shown as warning lights at the top and bottom. By default, a high value is considered “bad” and is shown as a red lamp. You can reverse the sense of the meter by reversing the high and low range values. By default, a high value is considered “bad” and is shown with all bars lit, including a red bar at the top. By default, a high value is considered “good” and is shown as a smile. See “Specifying Numeric Format Strings,” earlier in this book. Analyzer  Use this option to control whether this widget displays the Mini Analyzer button. High value color  Select the color to use for the section of the meter that displays values higher than the Upper Threshold option, which you specify in the meter name submenu. This option applies only to speedometers. Low value color  Select the color to use for the section of the meter that displays values lower than the Lower Threshold option, which you specify in the meter name submenu. Background color  Select the color to use for the background around the meter widget. Background opacity  Use this option to specify the opacity of the background. The value 1 means 100%. Type  Select the meter type. The default type is the meter type that you specify in the parent widget, as described in the previous section. Data Property  Select the property to display in this meter. Label  Specify the label for this meter. Apply Style to All Meters  Use this option to copy the styles from this meter to all other meters within this meter widget. The easiest way to systematically alter the appearance of dashboards is to define and use themes, which are discussed in “Defining and Using Themes”. Themes use many of the options described in this chapter. The speedometer includes an odometer box at the bottom; this box always displays the actual value from the data source, even if that value does not fall within the range of the gauge. Common options  See “Customizing Meters,” earlier in this chapter. Upper Range and Lower Range  Use these options to specify the lowest and highest numbers displayed on the speedometer gauge. In the following example, these options are 20 and 20, respectively. Use the Widget Settings menu to control the color used in the threshold area. See “Customizing Meters,” earlier in this chapter. Low Style  Use this submenu to customize the appearance of the value, when the value is below Lower Threshold. High Style  Use this submenu to customize the appearance of the value, when the value is above Upper Threshold. The fuel gauge is a narrow, vertical gauge with a needle that moves from left to right to indicate a value within a specific range (specified by Lower Range and Upper Range). The gauge distributes marks or ticks proportionally across its range, with Lower Range at left. 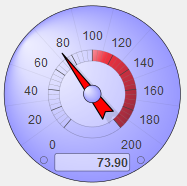 The fuel gauge displays its current value in a text box at the center of the gauge. Upper Range and Lower Range  Use these options to specify the range of values represented by tick marks on the fuel gauge. The traffic light consists of three round lamps in a column. From top to bottom, the lamps are red, yellow, and green. When the meter value is at or below Lower Threshold, the bottom lamp shows green. 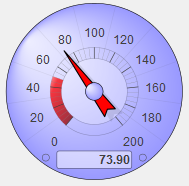 When the meter value is between Lower Threshold and Upper Threshold, the center lamp shows yellow. When the meter value is at or above Upper Threshold, the top lamp shows red. This system is useful when a large number indicates a condition that requires attention. Sometimes a low number indicates a condition that requires attention. 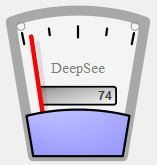 If so, you can reverse the sense of the meter; to do so, set Lower Range to a larger number than Upper Range. 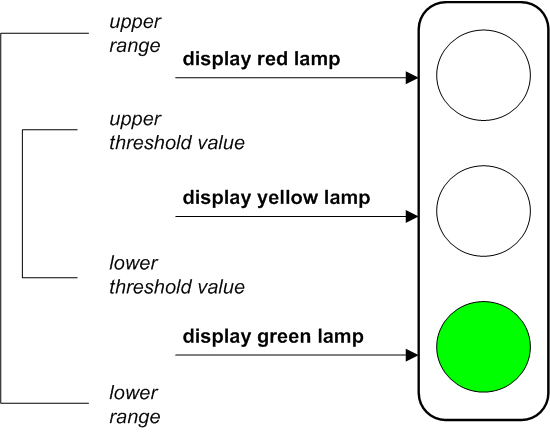 Then the red lamp indicates low values, and the green lamp indicates high values. When you reverse the range values, do not also reverse the threshold values. The light bar provides a stack of lamps arranged in a vertical bar. The light bar is similar to the traffic light, but its larger number of lamps provide a sense of movement from one end of the scale to the other. Upper Range and Lower Range  Use these options to specify the range of values represented by the light bar. The light bar is intended to appear off when the value is low, and fully lit when the value is high. The color of the bar shades from green (at the bottom of the scale) to yellow and red (at the top of the scale), implying that you should stop and address a problem when the value is high. This system is useful when a large number indicates a condition that requires attention. Sometimes a low number indicates a condition that requires attention. 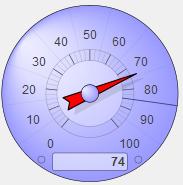 If so, you can reverse the sense of the meter; to do so, set Lower Range to a larger number than Upper Range. Then the fully lit lamp indicates low values, and the off lamp indicates high values. When you reverse the range values, do not also reverse the threshold values. The smiley face is the familiar yellow circle with two eyes and a smile. The mouth line changes depending on the value. The meter displays a smile when the meter value is near Upper Range. The mouth is a horizontal line at the midpoint within the given range. 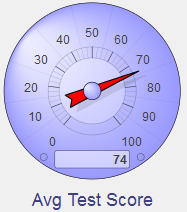 The meter displays a frown when the meter value is near Lower Range. This system is useful when a large number indicates a positive condition, and a small number indicates a negative condition. Sometimes a low number indicates a condition that requires attention. If so, you can reverse the sense of the meter. To do so, set Lower Range to a larger number than Upper Range. Then the smile occurs at low values, and the frown at high values.